My theme this year is the ABCEDARIA of Women who have inspired me. Emily Carr (December 13, 1871 – March 2, 1945) was a Canadian artist and writer heavily inspired by the Indigenous peoples of the Pacific Northwest Coast. One of the first painters in Canada to adopt a Modernistand Post-Impressionist painting style, Carr did not receive widespread recognition for her work until late in her life. As she matured, the subject matter of her painting shifted from aboriginal themes to landscapes—forest scenes in particular. As a writer, Carr was one of the earliest chroniclers of life in British Columbia. The Canadian Encyclopediadescribes her as a "Canadian icon". Now - why does she inspire me? So many ways - she had to fight the establishment to be accepted at all - as a young woman she waited until her parents' deaths in the early 90s before being able to attend art school. She struggled with a lack of resources as a single and eccentric woman in hide-bound Victoria, B.C. but she kept on. Her writing about that in the wonderful books The Book of Small, and Growing Pains in particular inspired me. And then there is her art. Oh... her glorious glorious depictions of the wilds of British Columbia. To see her forest paintings is a religious experience as far as I'm concerned. When she could no longer paint she continued to create by writing and did some of her finest work in her later years - all of that is deeply thrilling to me. I believe anyone who creates should read her autobiographical writing. She so brilliantly depicts the heart of the artist. Oh - and her quirky weird whacky ways - the menagerie she kept with a monkey and dogs. And how she kept herself sane and was also kind in her way to her sisters. 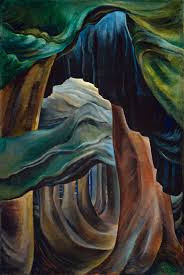 Yes, I deeply admire Emily Carr and am so glad to have seen her work in the National Art Gallery. Are there any artists out there who inspire you with their lives and works? I love the movement in the painting you shared with us. She definitely sounds like an amazing person and I love that she became more successful at her art later in life. What beautiful art!! I also admire her determination to follow her dream. That in itself is inspiring. Wow! What a painting! It's magical, mysterious, psychedelic... I even get a sense of Middle Earthness about it. Thanks all - and for those of you that have been introduced to one of Canada's most lauded and loved artists, please go at once to check out all her works, whether on line, at the library, in a gallery or bookstore! What a beautiful painting! I'm going to have to go look up more of her work. This post makes me wonder how many gifted artists we've lost to history because they didn't come from privileged lives with access to the "right" people. Thanks for this introduction! Hi Amy - I don't think we've lost Emily Carr - I think it is more the fact that Americans, who do rule the culture we get, have not noticed her. I would say most Canadians know her quite well. There are many of her paintings in the National Art Gallery of Canada and she was considered to be a distaff member of The Group of Seven - the most eminent group of artists in our country. Unfortunately education in the arts, and in particular in Canadian arts, is lacking. We all know Disney but we don't know Mary Cassatt (one of your famous women artists). I know one way we can help this problem. I'm a grandmother and I usually give my four grandchildren books for Christmas (in fact, not usually - always). For their birthdays I try something else but I don't want to get into a big plastic contest with all the other relatives competing for their hearts - so on my youngest grandchild's first birthday I gave the family a membership in the National Art Gallery (they live in our capital, Ottawa). I think that would be a grand thing to ask doting grandparents, godparents, uncles and aunts to do. You are not adding to the pile of loot but to the experience of a child at its most tender time. Every city of any size has a gallery or museum that a child can be taken to. Let's promote this idea. Emily Carr was surely an extraordinary woman thank you Jan for bringing her to our attention. I will seek her out, especially her autobiography. She deserves the status of icon. Yes there are many artists who inspire me - especially because of their intent to express in whatever way ..